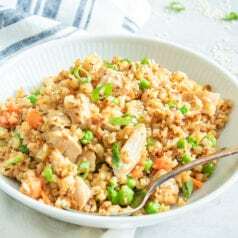 This alice springs chicken is an easy one skillet meal the whole family will love. 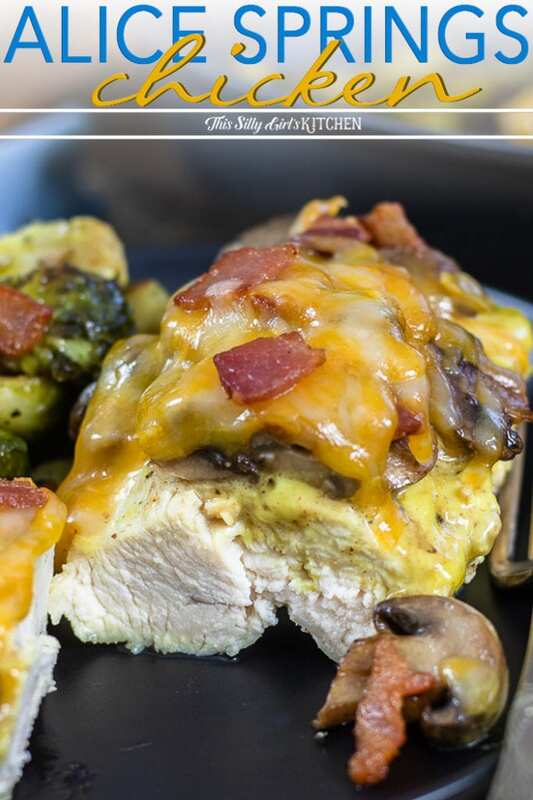 Chicken breasts topped with honey mustard sauce, sauteed mushrooms, BACON, and cheese – what’s not to love?! Scroll to the end of this post for a giveaway! What is alice springs chicken? An Outback steakhouse copycat recipe. 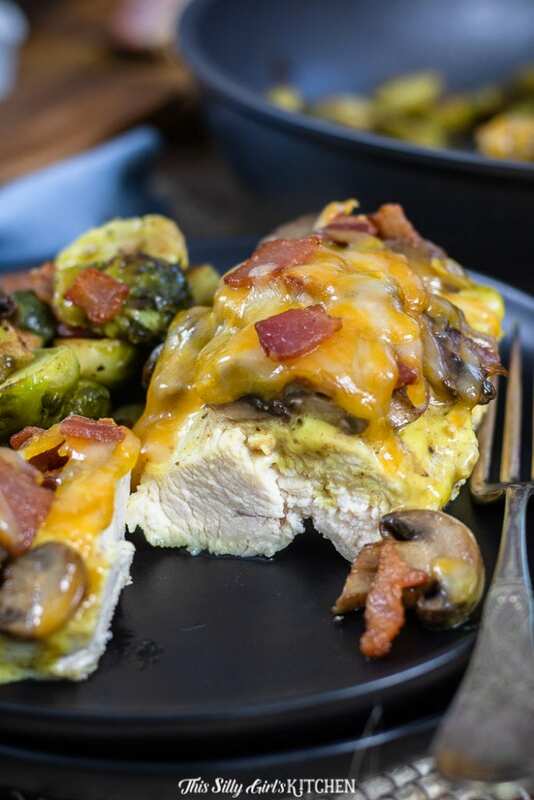 Chicken breast topped with honey mustard, mushrooms, bacon, and lots of melty cheese! 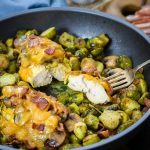 My version includes Brussel sprouts made all in one pan for a full meal. I love meals where you only have to dirty one pan, those are the best. 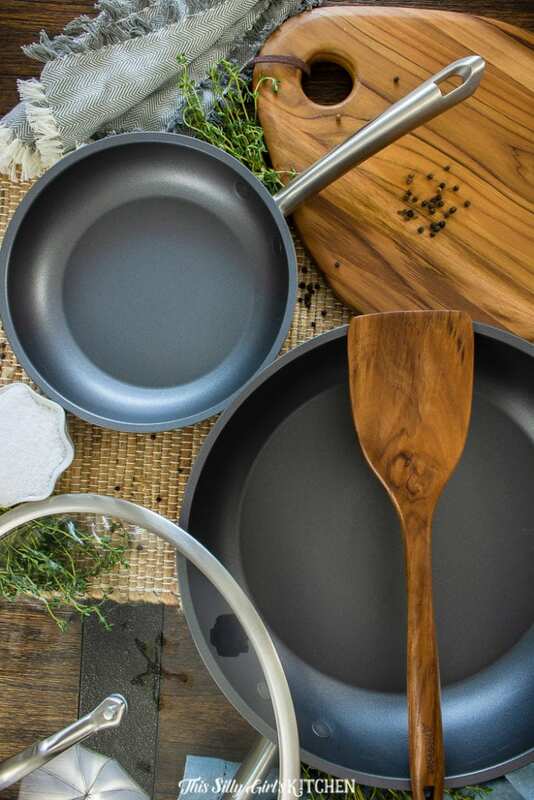 But, finding pans or skillets or saucepots that can go from the stovetop straight to the oven can be hard to find. Luckily with Anolon Gourmet cookware, I don’t have to worry about putting their pans in the oven, they are safe up to 500°F! I have been loving my new pieces from Anolon. Especially their Accolade 8″ skillet and Accolade 12″ covered deep skillet. They are nonstick, but the metal is also utensil safe, very important! With thick, sturdy bases, thin walls, and super tough rims, they provide faster even-heating with no warping. Perfect for my alice springs chicken recipe! Yes, this is an Outback steakhouse alice springs chicken copycat recipe. But, I added Brussel sprouts with bacon straight in the pan to make it a full meal. Since we are using one pan, we are going to cook our items in stages, then bring them all together in the end before serving. First, we cook our bacon, so we have the bacon grease to cook everything else in – yum! Next, we sear the chicken breasts that are seasoned in salt, pepper, and garlic powder. When they are golden brown, we transfer them to a plate. Sautee the mushrooms in the bacon fat that is still in the pan, set those to the side. Finally, add our cut Brussel sprouts, tossing in the remaining fat and adding a little butter! Get a good sear on the Brussel sprouts. THEN, add the chicken back into the pan. Place the pan directly into a preheated 350° oven until the chicken reaches an internal temperature of 160°. Top the chicken with the mushrooms, half of the bacon, and cheese. 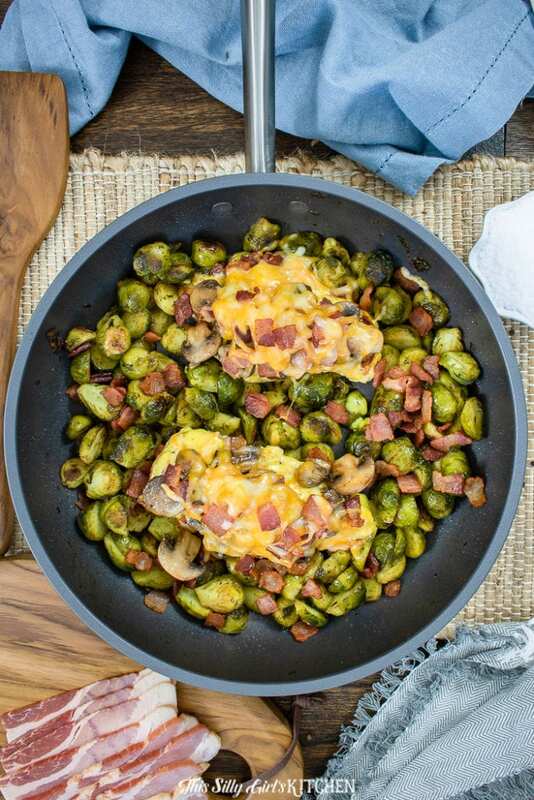 Sprinkle the remaining bacon on top of the Brussel sprouts. Return the pan to the oven to melt the cheese and that’s it! DO be extremely careful when taking the pan in and out of the oven. Even though they are oven safe, the handle will still get extremely hot. Anolon cookware is also dishwasher safe making for a super easy cleanup! Plus, the stainless steel handles are flush. Meaning they do not stick out from the interior of the pan, which makes it easier to clean. 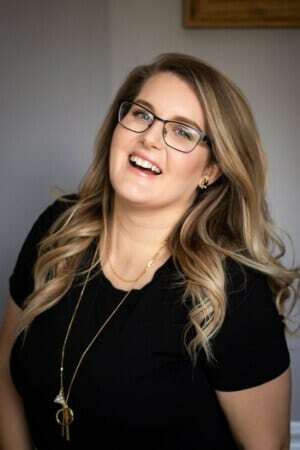 Is alice springs chicken low carb? 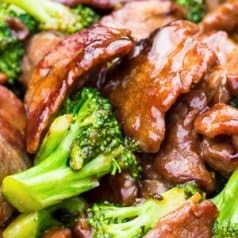 Do to the honey mustard sauce, it is not considered low carb. However, eliminating that ingredient will then make it low carb. I love just having a large helping of the brussel sprouts with this dish. If you are looking for more side items, I would suggest my Rosemary Roasted Fingerling Potatoes, roasted peppers, and cucumber salad! And for dessert (because, why not?!) my Cinnamon Cream Cheese Cookies, Cherry Cheesecake Bars, or Red Velvet Cheesecake Cake would go perfectly! Who wants to win an Anolon cookware set photoed above?! Follow the form below to enter! Giveaway only available to US residents. Giveaway ends on 11/30/2018. To learn more about Anolon watch their video by clicking here. In a 12 inch skillet over medium heat, add the bacon and cook until crispy. Drain the bacon, reserving the fat in the pan. Set the bacon aside for later. Season the chicken on both sides with salt and pepper to taste. Season with 1/2 teaspoon of the garlic powder. Over medium heat in the same pan with the bacon fat, sear the chicken on both sides until golden brown, they do not have to cook through. About 8 minutes. Set the chicken on a pan and set aside. Add the mushrooms to the pan and saute until cooked through, they will be slightly golden brown but not mushy. Take them out of the pan, and set aside. Finally, add the Brussel sprouts to the pan and toss in the remaining fat. Add the butter and toss to coat. Season with salt, pepper, and the remaining garlic powder to taste. Let sear until golden brown, about 5 minutes, tossing occasionally. 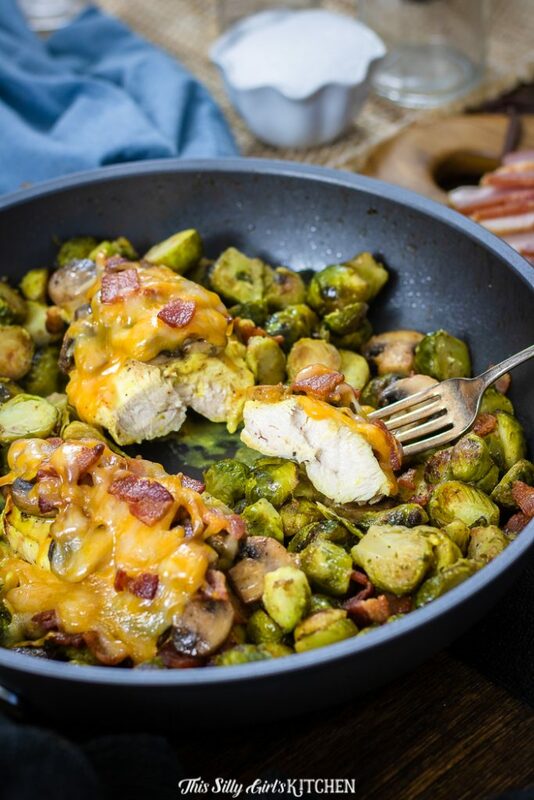 Place the chicken back into the pan with the Brussel sprouts, and place the whole pan into a preheated 350° oven. Cook until the chicken reaches an internal temperature of 160°, about 20-25 minutes. Top the chicken with the honey mustard, sauteed mushrooms, half of the bacon, and the cheese. 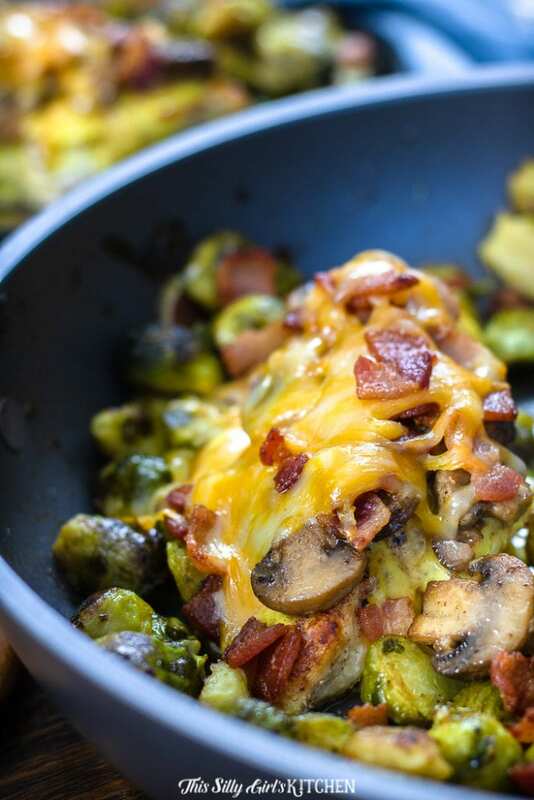 Sprinkle the remaining bacon over the Brussel sprouts and cook an additional 3-5 minutes until the cheese is melted. *Use your favorite mushrooms, I used basic white button mushrooms.